No matter what platform you may play it on, Wargaming.net has some special holiday activities going on in World of Tanks. Console, PC, and Blitz players are all getting a taste of Christmas cheer — although what you’ll be doing will depend on which version you play. Console players can look forward to the return of Toy Tank Mode. 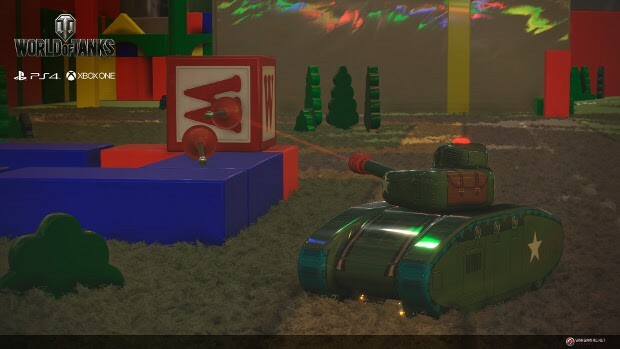 If you’re unfamiliar with the mode, just know that you’ll be playing in miniaturized toy tanks armed with suction cup dart rounds in a battleground filled with presents. Maneuver your tank through toy ramps, blocks, and whatever else you might expect to find in a toy room. When you destroy an enemy tank, a present will appear in the wreckage, giving whoever picks it up an added bonus. Keep in mind the event will only run on PS4, Xbox One, and 360 between December 23 and 26. PC gamers, on the other hand, can take part in the Holiday Ops event. Currently running, the event will grant players a New Year Tree and KV-2 Snowitzer. Upon completing missions, players will earn decorations for the tree and the tank that will allow them to enhance the “Festive Atmosphere level” and receive rewards. Finally, World of Tanks Blitz players can take part in the month-long “Winter Joy” event which kicks off Today. This event tasks players with completing special missions to earn tickets. Those who complete the entire chain of missions will receive the Premium Strv 74A2 tank — or a wad of tickets. The tickets can bet used in the Blitz Fair auction or to open chests. You know some days I really like this game …. Other days I want to slap the Devs and yell … WHY!!! !